DWI Checkpoints – everybody knows about them; most people dread them. Even if you have had nothing to drink, they can be a bit of a hassle. If you have had a drink or two, they can be a very scary event. No matter what your situation is, you should understand what to expect at a DWI checkpoint as well as what rights you have at a checkpoint. You may have read our blog on Fourth Amendment seizures as they apply to vehicle stops (click here for more information). A checkpoint does in fact constitute a Fourth Amendment seizure. Thus, a checkpoint must be reasonable in order to comply with rights set forth in the United States Constitution and North Carolina Constitution. 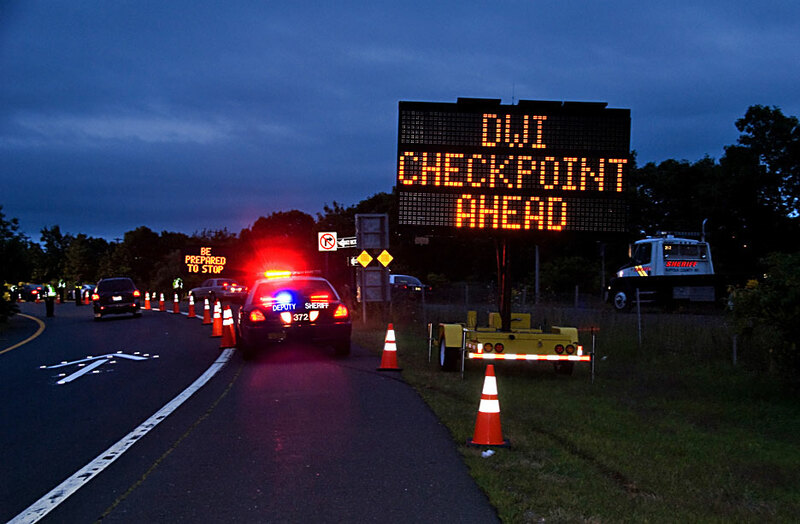 DWI/ DUI checkpoints are generally legal as long as they do not single out particular drivers and are serving a purpose such as protecting public safety. Now, let’s discuss what you should expect at a DWI checkpoint in North Carolina and what you are permitted to do (or not do) in such an event. You should not attempt to elude a DWI checkpoint. Generally, police can pursue you if you willfully evade a checkpoint. You may face additional charges. This can be a somewhat complicated area of law, so we won’t go into detail. Just know that, for the most part, you may get yourself into some (additional) trouble if you attempt to flee or evade a DWI checkpoint. You will be asked to hand these over. You are required to do this. Please do this at the officer’s request to avoid making trouble for yourself. Police may ask you questions, such as whether you have been drinking and how much you have had to drink. They may also ask you where you are coming from or heading to. You do not have to answer these questions if you do not want to. While you must cooperate with a police investigation, you do not have to incriminate yourself. You have the right to refuse to answer investigatory questions. If you are suspected of DWI, police will at some point ask you to step out of the vehicle. You don’t have a choice. Failure to do so may result in being charged with resisting an officer or other charges. If police suspect that you have been driving under the influence, they may ask you to perform some field sobriety tests. You can refuse to perform these tests. The purpose of these tests is to find probable cause to arrest you for DWI and to provide evidence of DUI if you are charged with DUI. These tests are to be used against you, not to help you. These tests are not mandatory. Many people who are not under the influence “fail” these tests because these tests are inherently difficult. In addition, these tests are carried out in extremely stressful and unnatural situations (late at night, police lights flashing, suspect is terrified, etc.). You will have to make an on-the-spot determination as to whether performing these tests is in your best interest. In theory, doing well on these tests can be favorable for you down the road if you are charged with DUI. If police suspect you of DWI, they may ask you to perform a breathalyzer test at a DWI checkpoint. You have the right to refuse this test. The purpose of this test is to help find probable cause to arrest you for DWI. This test is voluntary, not mandatory. Conversely, if you do happen to be arrested for DWI, you will be asked to perform a mandatory breathalyzer test at the police station. If you do refuse that test, you will automatically lose your license for one year. Click here to learn more. For more information on probable cause for arrest for DWI in North Carolina, click here and here.